Order the record now from Amazon, buy it from iTunes, or ask for it at your local record or toy or other store! 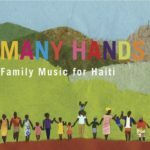 Simply put, Many Hands: Family Music for Haiti is the year’s best family music compilation and one of the year’s best kids music CDs, period. Buy two: one for your friend and one for your own family. Many families will thank you. Definitely recommended. Update: As of 2015, the CD has raised over $80,000 for the Haitian People’s Support Project, providing drinking water for thousands and school tuition for kids in tent camps, among so many other vital services. 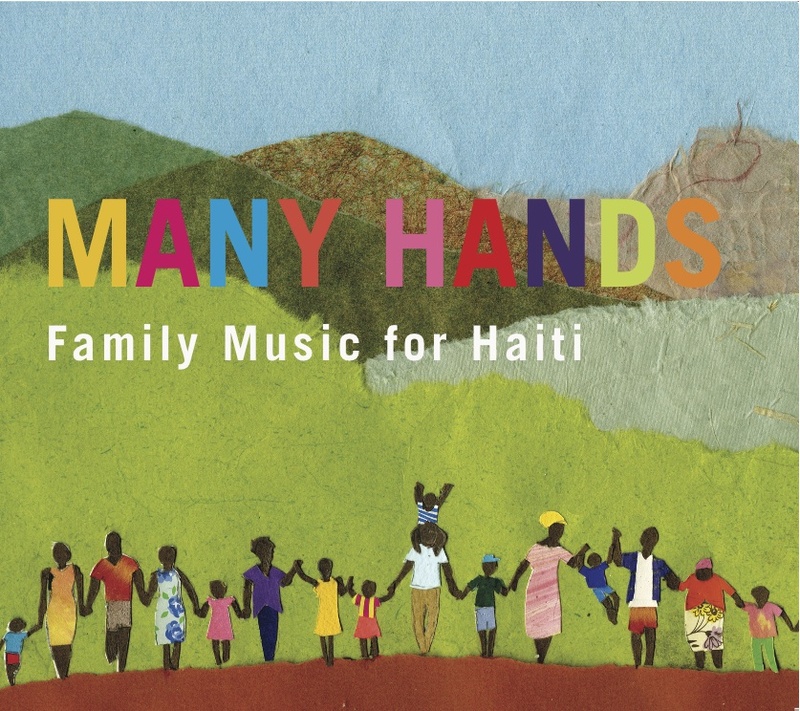 With a national release on August 10, 2010, Many Hands: Family Music for Haiti was the first release from Spare the Rock Records. This unique collection of songs is filled with uplifting messages from some of today’s very best family musicians. Many Hands is the debut album of Spare the Rock Records, founded by Bill Childs. “After speaking with Dean it was immediately obvious to me that this would be a great record, and, just as importantly, that it would have the potential to help keep people’s attention on the ongoing recovery of Haiti,” recalls Childs on how the partnership came to fruition. “Dean asked for some help reaching out to a few artists, and that just naturally flowed into my helping the record get a wider release; ultimately, that meant starting a label.” Childs produces, with his kids, the weekly radio show Spare the Rock, Spoil the Child. Bill also writes about kids’ music for various parenting magazines and has produced numerous kids’ concerts and is the cofounder of KindieFest, the family music conference. Saturday, September 11, 11:00: Randy Kaplan, Johnny Bregar, and Recess Monkey, Multnomah Arts Center, Portland, OR, presented by A Child’s Time to Rock! Sunday, September 26: Dan Zanes, Elizabeth Mitchell & Family, Rani Arbo & daisy mayhem, Secret Agent 23 Skidoo, Deedle Deedle Dees, Tony Vacca, Grenadilla, Pines Theater, Look Park, Northampton, MA. Major sponsors: Impish, Family Fun. Program sponsors: WRSI, Turn It Up!, Signature Sounds, Northampton Area Pediatrics, The Toy Box, Pedal to Properties, and the Daily Hampshire Gazette. My fascination with Haiti began years ago when I heard a CD called “Caribbean Revels: Haitian Raras and Dominican Gagas”, recorded by my friend Verna Gillis in the late 70s. Listening to that CD made me feel that Rara music was the most amazing and vibrant sound on the planet!! The energy and rhythms of the metal trumpets and percussion made me ecstatic. Bonga’s track (track 3) will give you a tiny taste. Haiti’s history is full of beauty, poverty and political struggles. Its long and often painful history was recently compounded by the 2009 earthquake that destroyed much of the capital city Port-au-Prince. Images of the devastation we have seen on the news will haunt us. For people with a personal connection to Haiti and its culture, there is a strong desire to restore the core of this very special culture. It will be a long road to recovery. While the recent destruction in Haiti is fresh in my mind, it’s the warmth, beauty and generosity of the Haitian people that I have met that is the inspiration for this CD. The idea came to me in a flash in the middle of the night. And the very next day eight of the artists on this CD offered, with no hesitation, to record tracks! Everyone involved in this project gladly donated their time and efforts, with many of the musicians writing and recording brand new songs just for Many Hands. I could not have created this CD without the generosity and talent of these amazing musicians and artists. Also, a big thanks to Bill Childs for creating a record company to bring this CD to life! Lastly, thank you for buying Many Hands. I sincerely hope you enjoy listening to a CD that is part of rebuilding Haiti. If you wish to do more, please consider donating to the Haitian People’s Support Project. Thank you to, first and foremost, the Haitian People’s Support Project for their tireless work in Haiti. Thanks to the musicians, recording engineers, visual artists, and everyone else who contributed so much time and talent to this project. Thanks also to Stephanie Ellis, Dena Childs, TMBW.net, Stefan Shepard, Jeff Bogle, Jeff Giles, Jim Olsen, Stephanie Mayers, Beth Blenz-Clucas, Marty Beller, Sarah at A to Z Media, Peter Wright at Virtual Label, Neva Wartell, Wendy Reid, Lori Gross, Robert Bard, The Big Sky Ensemble, Mark Brown, and WRSI (93.9 The River). Bill dedicates the record to the memory of his father, W. Ves. Childs. Bonga – Activity (Bonga) Produced by Bonga, Co-produced by Rufus Cappadocia and Glen Marshall. Bonga- Vodou drums, banbou, vocals, James “Tiga” Jean-Baptiste- Vodou drums and percussions, vocals, Alisha Zebulon – vocals, Sheila Anozier – vocals. Recess Monkey – Fiddlehead Fern (Drew Holloway, Daron Henry, Jack Forman) Produced by Recess Monkey with special guest Elena Murillo on fiddle. Dog on Fleas- Sing about the Sun (Dean Jones)– Produced by Dean Jones. Chris Cullo –shakers, John Hughes – guiro, Dean Jones – guitar and voice. Elizabeth Mitchell- Bright Morning Stars (traditional) Recorded by Warren Defever. Elizabeth Mitchell – vocals, Daniel Littleton – vocals, Ruth Ungar – fiddle, Kristen Jacobsen- piano. Caspar Babypants – Check it Out (Caspar Babypants) Produced and performed by Caspar Babypants. Secret Agent 23 Skidoo – Noise (Secret Agent 23 Skidoo) Produced by Secret Agent 23 Skidoo. Engineered and mixed by Julian Dreyer. Al Al Ingram – hook vocals, Valerie Johnson- hook vocals, Frank Mapstone – keyboards, Greg Hollowell, Ben Hovey and Derrick Johnson – horns. Jonathan Coulton- The Princess Who Saved Herself (Jonathan Coulton) Produced and performed by Jonathan Coulton, with a cameo by Lacey Kohl. They Might Be Giants – My Name is Kingof Socks (TMBG) Produced and performed by They Might Be Giants. Lunch Money – You Are Here (Molly Ledford) Produced by Molly Ledford and Jay Barry, Molly- guitar and vocals, Jay- bass and snare. Henry Barry- guest vocals. Pete Seeger- Quite Early Morning (Pete Seeger) Pete Seeger – banjo and voice, Lori Gross, D. Fraser and Fiona Fraser-Gross – chorus. Recorded by Dean Jones beside Pete’s woodstove. Note the crackling! Dean Jones – Little by Little (Dean Jones, Jerrice Baptiste, J. Mage) Produced by Dean Jones. Featuring Eli McNamara – vocals, Jerrice Baptiste – Creole vocals, J. Mage – magic, Dean Jones – vocal, keyboards, etc. Grenadilla – Arabella Angelique (Debbie Lan) Produced by Debbie Lan and Ken McGloin. Debbie Lan- piano and voice, Leah Glennon, Jodi Palinkas, Annmarie Callan, Brittany Sacash, Natasha Williams – vocals, Ken McGloin- bass and guitar, Dean Sharp- percussion. Gustafer Yellowgold – Penguin Day (Gustafer Yellowgold) Written, produced and performed by Gustafer Yellowgold. The Deedle Deedle Dees – Zora (Lloyd Miller) Produced by Bradford Reed; additional vocal production by Marty Beller, Ulysses S. Dee (Lloyd Miller)- bass, vocals, Innocent Dee ( Anand Mukherjee) – guitar, Booker Dee (Chris Johnson)- organ, Otto von Dee (Ely Levin) – drums. Jerrice Baptiste – Many Hands (Jerrice Baptiste) Jerrice Baptiste – English and Creole recitation. Recorded by Dean Jones on a rainy night.